Powerful earthquakes shatteres Indonesia and spawned a three-meter-high (10-foot-high) tsunami. But a quirk of nature sent the full force of the waves out to sea, and there was no repeat of the devastating 2004 Indian Ocean tsunami. At least 10 people were killed and scores injured in the three strongest tremors, which struck within a 24-hour period. Afraid the worst was yet to come, hundreds of residents spent Thursday night sleeping in parks or on sidewalks. The 8.4-magnitude quake that first shook Southeast Asia on Wednesday was the strongest this year. But the huge mass of water it spawned was pushed to sea rather than land, said Mike Turnbull, a seismologist at Australia's Central Queensland University. "It's a quirk of nature that this is how it happened," he said, noting that pressure between the shifting Australian Indian and Asian plates has been building up over hundreds of thousands of years. "It could have quite easily have been the other way." A three-meter (10-foot) wall of water slammed into at least one fishing village on Sumatra, the island ravaged by the 2004 disaster that killed more than 230,000 people in a dozen nations. Rukhlan, a 43-year-old angler, said residents of the village, Muara Maras, were horrified when they saw the ocean retreat and then race back to shore. "I heard people screaming and yelling tsunami! tsunami!" he said. "I ran to find my children, but they had already gone to the hills." A 65-year-old woman, Asiah, felt weak when the earth started moving beneath her. "I was having difficulty breathing or walking," she said. "I was afraid. My son grabbed hold of me and carried me out of the house. All I could do was pray." A dozen houses were swept out to sea. Smaller waves were recorded further down the coast and on at least one nearby island. Two powerful temblors - magnitudes 7.8 and 7.1 - followed on Thursday off Sumatra and a smaller quake also shook Sulawesi island, thousands of kilometers (miles) to the east, the U.S. Geological Survey said. Indonesia issued and then lifted tsunami warnings throughout the day, the last one for a 6.2-magnitude tremor that struck at 11:09 p.m. 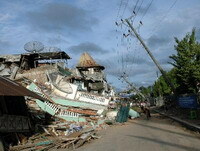 The worst destruction was caused by the jolts along the coast, especially in the Sumatran city of Padang. Almost all the quakes were less than 200 kilometers (120 miles) from the shore and around 20 kilometers (12 miles) deep, the USGS said. "At least five large buildings - including mosques, houses and a school - collapsed," said Surya Budhi, who was overseeing emergency response in the area, and rescuers were searching for survivors at a badly damaged car dealership. A fire also broke out on the fourth floor of a shopping mall. Yulinar, a fisherman's wife who lives with her husband and five children in a wooden shack at a waterfront market in Padang, said the magnitude-7.8 quake that struck at 6:49 a.m. was so powerful she had to grab onto a table to keep from falling down. "It was very bad," said Yulinar, who fled inland with her family after a tsunami warning from the mayor was broadcast through mosque speakers. "I was so scared the tsunami was coming." The 7.1 quake pounded Sumatra at 10:35 a.m.
More than 30 aftershocks have rattled the region in the last day and many people refused to return to their homes, fearing a repeat of the 2004 tsunami. Nearly two-thirds of the deaths in that disaster were in nearby Aceh province. Telephone lines and electricity were disrupted across a large swath of Indonesia, making it difficult to get information about damage and casualties. Death tolls released by several agencies ranged from five to 10. Rustam Pakaya, the chief of Health Crisis Center, gave the latter figure, which was based on information gathered from local hospitals, clinics and regional health offices. He said at least 49 people were injured. Sensitive to criticism about slow responses to the 2004 tsunami triggered by a monster magnitude-9 quake, governments issued alerts as far away as Kenya and Tanzania in East Africa, telling people to leave beaches. People in Mombasa, Kenya, crowded into buses after hearing the warning over the radio. Thailand's National Disaster Warning Center sent cell-phone text messages alerting hundreds of officials in six southern provinces, and authorities also were told to prepare in India's remote Andaman and Nicobar islands. Sri Lankans were told to move at least 200 meters (650 feet) inland. Indonesia, the world's largest archipelago, with a population of 235 million people, is prone to seismic upheaval due to its location on the "Ring of Fire," an arc of volcanos and fault lines encircling the Pacific Basin.